We've put together the most popular products and reduced the price! You can save £100's and still qualify for any price promotions/discounts! White PVCu Fascias and vergeboards / PVCu Gutters and downpipe / 4' White PVCu fixed window / 3' Galvanised steel white vertically ribbed access door and a sand & cement fillet to seal the inside of your shed. White PVCu Fascias and vergeboards / PVCu gutters and downpipe / 4' White PVCu opening window / 3' Galvanised steel white Georgian door with 3 point locking for additional security and a sand & cement fillet to seal the inside of your building. Our concrete sheds and workshops are available in all 4 basic building shapes - Pent, Apex, Apex15, Apex20, and with our unique Design & Build service we can offer the ultimate in flexibility. 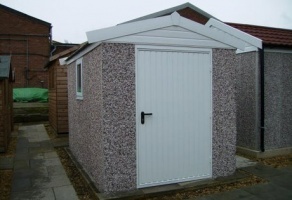 With a choice of building shapes and the full range of options, your shed can be specified exactly as you want it. Choose from a huge range of different sizes, 12 different wall finish options, a huge choice of roof styles and colours, timber doors, steel doors, PVCu doors, glazed doors or even no door! Timber windows, PVCu windows, fixed or opening windows, PVCu facias, Decograin Golden Oak and Rosewood fascias - the combinations are endless!